This one is all about meal planning prep work. I like to have hard boiled eggs in my fridge so that I always have a protein source at hand without having to cook anything. I prefer to cook eggs in bulk and peel them all at once so they are ready to go whenever. I cooked 5 different batches of a dozen eggs in the Instant Pot until I settled on the final cooking and cooling times. The recipe works and allows you to cook a dozen eggs in a foolproof way where you don’t have to wait for a pot of water to come to a boil! Instant Pot slow cooker – I use the IP-DUO60 model. One dozen eggs, straight from the fridge. One cup of cold tap water. 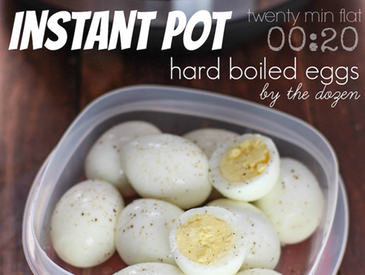 Place your water, rack, and eggs into the Instant Pot. Distribute the eggs evenly so that they are not touching the sides of the pot, then stack additional eggs onto them. Cook on Manual for 8 minutes. 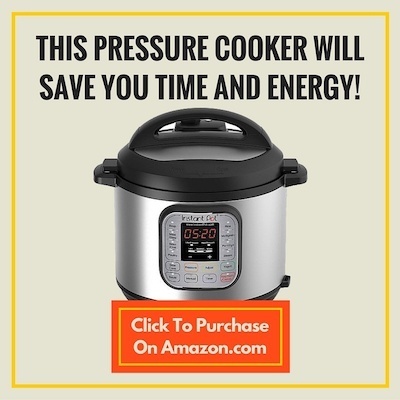 Quick release the pressure as soon as your 8 minute cooking program completes. 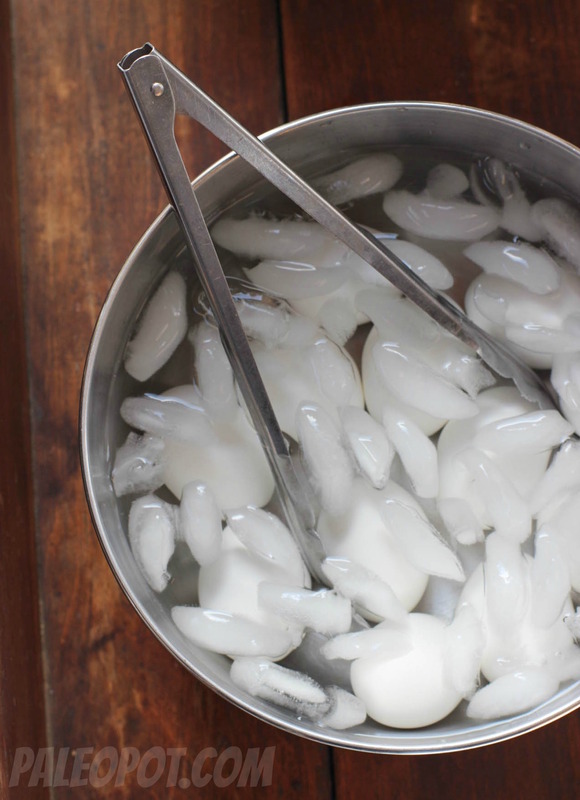 Use tongs to transfer the eggs to an ice water bath for 7 minutes. 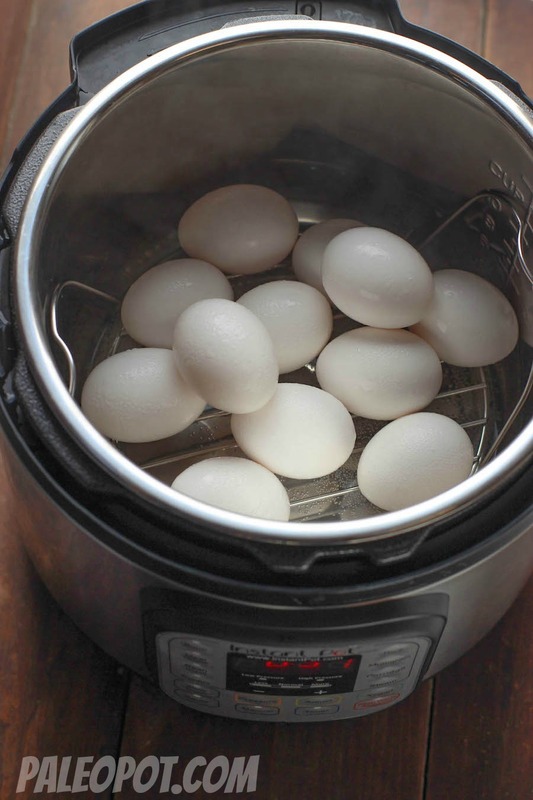 5 minutes for the Instant Pot to come up to pressure, plus 8 minutes cooking time, plus 7 minutes cooling time = 20 minutes flat for a dozen eggs! I transferred the eggs into an ice bath for 7 minutes, bringing the total cooking time to 20 minutes. They peel quite easily! 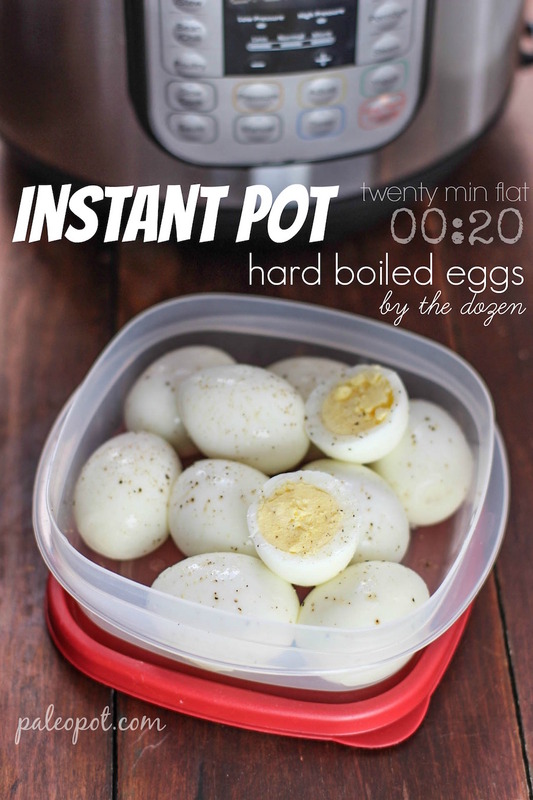 How to cook a dozen eggs in your Instant Pot in 20 minutes flat! 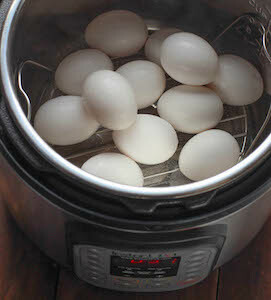 Fill your instant pot with the steamer rack, then your water and eggs. Set the Instant Pot to cook on Manual for 8 minutes. Transfer eggs using tongs to an ice bath, letting them sit for 7 minutes. On the bottom row, the button that says manual, under the pressure button. Is the manual button the same as the pressure cook button where you can set your own time and pressure? Is it low or high pressure for eggs? I have an IP-DUO. Thank you! I would use low pressure, yet I do not have that model cooker. Did you use high or low pressure? I tried cooking some for 8 minutes at high pressure, did a quick release and some of the eggs cracked. Then I tried cooking for 5 minutes at high pressure, did a natural release. None of the egg cracked but the egg yolks had a green ring. The coloration is most likely due to the source quality of your eggs. I tried this and they came out rubbery. What did I do wrong? It could have been the batch of eggs? Hope it works out better next time. On Amazon I discovered a perfect tool for cooking eggs in pressure cooker. It’s EggAssist. With this you don’t have worry about the eggs rolling around inside the pressure cooker. The the egg holder can also be used as a hot pad. I absolutely felt in loved with this purchase. Thanks for the tip. Link it! Any idea what the manual setting would be for the new version of instant pot….duo plus? Low or high ?and then also there is a choice after that ….I think normal or high ….lots of choices and I think it makes a big difference….thanks for any input! High pressure or low pressure? every time from now on. Thank you! How does the yolk turn out in these hard boiled eggs? I like my yolk pretty soft and yellow not hard. Just wondering if I should adjust the cooking time. Thanks! This recipe tests at firm yolks. For your desired consistency, I would simply cook the eggs on the stove and have an ice bath ready. I bought 1 dz jumbo eggs and they filled it so I had to put tin foil around the side to keep them from touching the side of the pot. The photo shows a dz easily fitting. Did you use smaller eggs? My pressure cooker isn’t an Instant Pot and doesn’t have a rack. Can I still do this without the rack? I don’t have the Instant Pot brand and mine did not come with a rack. Any suggestions? Have tried this using an IP Ultra and it worked very well. A couple comments: it’ll take a little longer in the Ultra than the DUO60 simply because the larger pot takes longer to both come up to pressure and to release. The 8 minute cook time worked, but if you want a firmer yoke for, say, slicing for salads, another minute would help. Also, maybe everyone else knows this, but I had to check other sites: cook on High Pressure. Finally, peeled HB eggs can be stored in the fridge for up to five days or seven days if left unpeeled. Both should be in an airtight container. All in all an easy recipe that just works. “PRESSURE” = low, medium, high??? What is the pressure setting for cooking the dozen eggs for 8mins on the manual setting??? I am going to let it select the pressure setting automatically and see what happens??? Can you cook more than a dozen, say 18 or 2 dozen even at the same time, same directions or would the cooking time change or egg balance be off? This recipe is guaranteed accurate for a dozen eggs. I’ve never tried cooking more than that at once. Do let me know if you give it a try.